Buddy, remember, there are a lot of links to a lot of things at the top of the ASIG front page. What to expect for sea ice around Antarctica? It looks like the Ross ice shelf totally melts out. It even looks like polynya are starting to form there right now. Is either of those things normal? I think all the ice shelves in these images are shadowed in with the land mass, as these are not considered to be the same as sea ice and thus not counted with sea ice extent. interesting forecast, but the images are dated 2016. typo? That makes a lot of sense. I was wondering why the sheets didn't cleanly line up. I guess given its vastly different properties - being so much thicker - it's not so meaningful (or unusual) for the front between sea and ice to be there. One of the ice shelves, Larson C, has a long crack and is in danger of breaking off soon, making a giant iceberg. There is a thread about it, if you haven't seen it. For Nov. 23rd JAXA has posted SIE around Antarctica to be 12,896,355 km2. For Nov. 23rd JAXA has posted SIE around Antarctica to be 12,736,966 km2. One of the last large intact areas of sea ice is about to break up. This is about 850 km from Ross Ice Shelf. This area was several hundred thousand km2, and will only break up more now. So what about the article being circulated by WUWT that according to explorer log books from 100 years ago the Antarctic ice is unchanged? I'm sure the log books were unbiased and relatively accurate. What about the interpretation? I read that some say that collapse of Ross shelf would dramatically raise seal level. So what is the volume of the shelf above water? I read that about 90% of the ice is below seal level. In addition, when ice melts its density increases from about 0.9167 g/cm3 to about 1 g/cm3. That means the total volume of the ice, if melted, would not be much more than the volume of ice already under water. So if the unthinkable happened and the Ross ice shelf completely melted, how much would it raise sea levels? It doesn't appear to me that melting would have much affect at all since the volume of ice, when melted, would be reduced to about the volume of ice already underwater, which already displaced an equal volume of water throughout the world's oceans. Or would it be a bell weather of other catastrophic events that will raise the sea level, like the melting of the ice pack on Antarctica? Just curious why scientists predict massive sea level rise without considering the net effect of melting on density and volume. If they mean it will be a bell weather of other bad things it would be more accurate to say so. Otherwise, it is easy to criticize their alarmism if their predictions don't hold water, so to speak. No, Feeltheburn, you haven't caught scientists in a massive blunder. We all know that the melting of floating sea ice does not directly raise sea levels. The problem with ice shelf destruction is that these shelves buttress glaciers that flow toward the sea. Eliminate the buttressing, and glaciers speed up dramatically. Massive sea level rise from Antarctica does not require one square km of the surface to ever be above freezing. I read that some say that collapse of Ross shelf would dramatically raise seal level. So what is the volume of the shelf above water? I read that about 90% of the ice is below seal level. FTB again it seems you are reading too many denier sources and get confused in the process. Ice shelves and ice tongues by their very definition are floating. 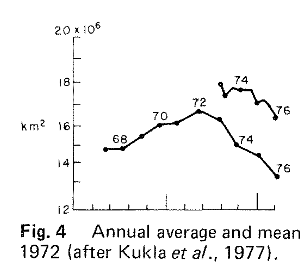 Floating ice when it melts doesn't change sea level except for some salinity-related negligible stuff. So does it mean all is well and we are saved? No, unfortunately. Antarctica is raising sea levels by its glaciers flowing towards the sea more quickly (in terms of water mass) than the snow that gets deposited on the continent. When glaciers are accelerating and their calving fronts retreat, sea level rises more quickly. When ice shelves collapse, glaciers are significantly accelerated. Note that you should worry more about Pine Island Glacier and Thwaites Glacier in West Antarctica instead of the Ross ice shelf, in terms of earlier risk of SLR. Finally, I recommend that you pick one thread per week in the Antarctica sub-forum (or actually anywhere on the Cryosphere sub-forum) and read it from its beginning 2-3 years ago. You will gain a lot of knowledge and be less confused by deniers sowing misinformation and disinformation. NSIDC has a drop of -144K for today. ftb, please stop reading WUWT unless you want to be continually misinformed. And if you must insist on reading there, please stop bringing their tripe over here. And if you insist on bringing it here, ask about it in the proper forum...stupid questions. Thanks. Suppose I was to apply this method today, with much better global positioning data, and much more uniform recording methodology. Suppose I was to gather data from 14 voyages over 20 years, and compare that to computer models (I get to pick which models, of course) and claim that from that limited amount of data I could calculate the boundaries of the Antarctic sea ice in limited areas throughout the year. I think that scientists would question any conclusions I came to from this very limited amount of data. The yearly variation in sea ice extent alone is pretty large, not to mention variations in collection methodology, observer bias, and so on. We have gone over it a couple times in this thread. When ice shelves melt or fall off, they raise sea level. Glaciers do as well. Neither are the same as sea ice. Many ice shelves rise tall above sea level and are not floating, though a portion of these sit below the water. some folk's goal here is to dilute threads thus reducing their value . I'm beginning to think there may be good money in doing so .. causing distraction and repetition is more subtle than just playing stupid .. Thanks. I stand corrected. Even feeding trolls can be instructive. I can't say too much, as I am guilty myself of not reading a whole thread every time. FTB again it seems you are reading too many denier sources and get confused in the process. <snip>. We have gone over it a couple times in this thread. When ice shelves melt or fall off, they raise sea level. Glaciers do as well. Neither are the same as sea ice. Many ice shelves rise tall above sea level and are not floating, though a portion of these sit below the water. See also the figure below from here, especially the grounding line. My understanding thus fare was: Only when the land ice has crossed the grounding line (the line that seperates the ice sheet from the ice shelf) it contributes to sea level rise - but on the long run only, if the ice mass loss through the ice outflow is greater as the mass gain ( through precipitation for instance). Is that wrong? PS. I just read in the linked Wiki article above, that the melting of ice shelfs does indeed rise sea level, but only marginally. The ice from the WAIS alone would rise sea levels by +3 meters. Although it is believed that the melting of floating ice shelves will not raise sea levels, technically, there is a small effect because sea water is ~2.6% more dense than fresh water combined with the fact that ice shelves are overwhelmingly "fresh" (having virtually no salinity); this causes the volume of the sea water needed to displace a floating ice shelf to be slightly less than the volume of the fresh water contained in the floating ice. Therefore, when a mass of floating ice melts, sea levels will increase; however, this effect is small enough that if all extant sea ice and floating ice shelves were to melt, the corresponding sea level rise is estimated to be ~4 cm. However, if and when these ice shelves melt sufficiently, they no longer impede glacier flow off the continent, so that glacier flow would accelerate. This new source of ice volume would flow down from above sea level, thus resulting in its total mass contributing to sea rise. Are you sure about that? Would be great if some of the experts on the forum could clarify that. In general terms I concur with S.Pansa's points; however, I note that ice shelves also serve to buttress marine glaciers so as the ice shelves degrade their buttressing action also degrades. This results in an acceleration of the ice flow velocity of the marine glaciers; which typically resulting in a faster rate of sea level rise. Thanks AbruptSLR for the clarification & the additional info about the buttressing effect! The amount that sea ice or ice shelves raise sea level is estimated to be about 2.6% of its volume. We usually don't even worry about this with sea ice because it is usually small amounts, and while it is thawing at one pole it is freezing at the other and will return in each one respective season anyway. That's in a normal world of course. As less freezes back each year, it will have some impact. The difference with ice shelves, especially in this thread because its Antarctica we are talking about, is simply that these are extremely huge and towering compared to sea ice and thus the 2.6% is no longer negligible. P.S.I apologize for an earlier comment that an ice shelf raises sea level instantly upon calving. That much was wrong. It has to melt first. And I should not have equated ice shelves with glacier ice, which goes entirely toward sea level rise. I apologize for an earlier comment that an ice shelf raises sea level instantly upon calving. That much was wrong. It has to melt first. Just to be clear, ice shelves consist of glacial ice and it can take decades (depending largely on size) for them to melt, even after calving. I am sorry if I caused confusion in the way I worded that. I only meant to differentiate ice shelves and glaciers in the sense of a scenario in which a glacier (that is in a position to do so) calves off directly into the ocean and the effect on sea level, whether it melts sooner or later. It would all go to raising sea level, whereas the ice shelf is glacial ice that's no longer grounded but floating has a marginal effect. I wasn't trying to say it was a different kind of ice. My guess would be that in the good old days it didn't matter as much. As glaciers pushed out past the grounding line and made shelves, and some broke free and floated off, the glaciers were rebuilt at a similar rate from snowfall and so forth. Only as the cycle starts to fail, does it matter. No? For Nov. 26th JAXA has posted 12,460,979 km2 for SIE around Antarctica. Down by 155,213 km2 from the 25th. Ok, fine gentlemen involved in earlier discussion about ice shelves. A little belated addition to the discussion. I dug around trying to remember where my reasoning came from. The 2.6% of total volume of the ice shelf added to sea level may be low in most cases.Why? Simply because buoyancy only partially supports the ice shelf. The rest of the support comes from the fact that the shelf is in cantilever situation over the grounding line. I think that I may have been under the impression that the cantilever was a larger portion than it actually is of the two. After further review, I see that the buoyancy is. Of course as the glacier pushes the shelf outward, the downward pressure becomes too great for the available buoyancy and a shear occurs. Then the cycle repeats until getting out of balance again. I thank you all for pushing me to learn more. The Weddell polynya indicates there were unusually warm waters beneath, but researchers won't know for sure until they can retrieve and analyse data from floats, Dr Reid said. Some extreme weather, which also brought in warmer air from the north, may have helped corral the thinning ice into smaller areas. "That atmospheric pattern exacerbated the regions of lower-than-normal sea ice," he said. A gauge of the relative strength of the westerly winds that circumnavigate Antarctic – known as the Southern Annular Mode (SAM) – had also turned negative in November. That means higher-than-usual pressure over the continent and lower pressure at mid-latitudes, a set-up conducive to a hot, dry start to summer, the bureau said this week. "It's well known that a negative SAM is associated with less sea ice, so it seems likely that this has played a part in the decrease of ice during November," Dr Turner said. The bureau's Dr Reid said the big El Nino in the Pacific – rated third strongest during the satellite era – was also a factor in making sea ice behaviour down south a more complicated tale than at the North Pole. For Nov. 27th JAXA has posted 12,318,519 km2 for SIE around Antarctica. From NSIDC, the drop at Nov 26 was even bigger, -193K. The SIE isnow at 12,485 Mn km2 which is about a million km2 lower than 1986 at the moment. Oren, thanks for the beat down. As a luke-warmer I will continue reviewing all sides, thank you very much. More to the point, if your and other's response to my questions are that (1) I'm too stupid to be asking questions and (2) I should get informed elsewhere before wasting your time here, then what is the purpose of this forum? If you and everyone else only want to hear words that confirm what you already know, is it really a forum or just a testimonial blog? Seems to me that you and others have a golden opportunity to answer those of us who have legitimate questions. Simply slamming me as just another stupid denier is not winning me over, and it won't win anyone else over who isn't already singing in the choir. On the other hand, you were much harder on me than on the responder who stated, incredibly, that the Ross Ice shelf will in fact cause sea levels to rise because it is sticking far above the sea surface than normal sea ice. I have read no scientific argument that this is the case. Nor could it be unless (1) the Ross Ice shelf is not floating but sitting atop an underwater continental shelf of land, in which case it's not really an "ice shelf" but an ice cap of sorts, (2) it is so strong and rigid that it is fastened to the edge of the continent with enough force so as to be cantilevered, or (3) it is floating in the midst of a previously unknown levitation field. If (1) and (2) are actually true, then the Ross Ice shelf isn't likely to break up anytime soon. If it's (3) then God help us! My questions may irritate you and others, but at least I don't say things like the ice shelf isn't floating but is suspended in mid-air by unknown forces. Of course, the law of gravity and Archimedes principle tell us that, if the ice shelf is floating on top of the water like any other sea ice, when melted, the resulting volume of melted water will exactly equal the volume of water displaced by the weight of the ice shelf. Hence, no sea level rise. Of course, if the real situation is that the ice shelf is acting as a dam to stop the flow of glaciers to the sea, then I get that. That is the nuanced argument that needs to be made. Not the manifestly false assertion that the ice shelf itself will raise sea levels. That was my point and it's not misinformation. Thanks Willi. You made my day. I always like teachers who tell students they're just plain stupid. You are so smart and I'm so dumb. Thanks for wasting 10 seconds of your day to tell me so. Ok TT, I didn't see anywhere where you've gone other this. Can you provide me a source that explains how and why the Ross Ice shelf "rises tall above see level and [is] not floating"? What would be the cause of this gravity defying phenomenon? Is the shelf sitting atop a solid underlying surface? Or is it so strong and tightly fixed to the edge of the continent so as to be cantilevered? Can hundreds of miles of ice be cantilevered at the edge? If you've explained, thanks in advance. However, I must have missed it so please give me a link. "Because ice shelves already float in the ocean, they do not contribute directly to sea level rise when they break up. However, ice shelf collapse could contribute to sea level rise indirectly. Ice streams and glaciers constantly push on ice shelves, but the shelves eventually come up against coastal features such as islands and peninsulas, building pressure that slows their movement into the ocean. If an ice shelf collapses, the backpressure disappears. The glaciers that fed into the ice shelf speed up, flowing more quickly out to sea. Glaciers and ice sheets rest on land, so once they flow into the ocean, they contribute to sea level rise." That is the nuanced view that I agree with. I don't agree with your assertion that a melting ice shelf will by itself contribute to sea level rise. Stop the concern trolling. Final warning. Read all of the comments before quoting. FTB. As I pointed out, I myself have had to make some adjustments in my thinking about this matter. As I pointed out, while there is a cantilever force involved with these,it is not the dominant one. Buoyancy carries most of the load. When the cantilever starts to carry too much, shearing becomes imminent. This would prevent the shelf in and of itself from ever being in a situation to cause sudden, large scale sea level rise. Only that it would no longer be there to protect the glacier, and that would be a concern for sea level. You have my sincere apologies. You will note that I never called you names or continuously belittled you, even when I thought I was right, as that is not my policy. Big drop today, -223K according to NSIDC. We are somewhat less than 1 Mn km2 lower than 1986 and another 400K lower than third lowest year for the date 11/27..
1982 holds the current record for earliest date to cross the 12Mn-mark. It did so at about December 5. The 5-day average for December 6 in 1982 was 11,805 Mn km2. On a more realistic optimistic note, we are now less than 1 million km² below the old record on IJIS for the date, the first day since November 11.
it's not the content and/or the questions as a standalone, it's the quota that caused some reaction. As we saw with Larsen B ice shelves can depart their anchorage very swiftly and surveys in the mid noughties linked this behaviour to Ross. In the early noughties it was found that Ross was becoming warm enough to experience such disruption if that warming continued. By 2012 the warm waters that had been travelling down from the Peninsula arrived at Ross. 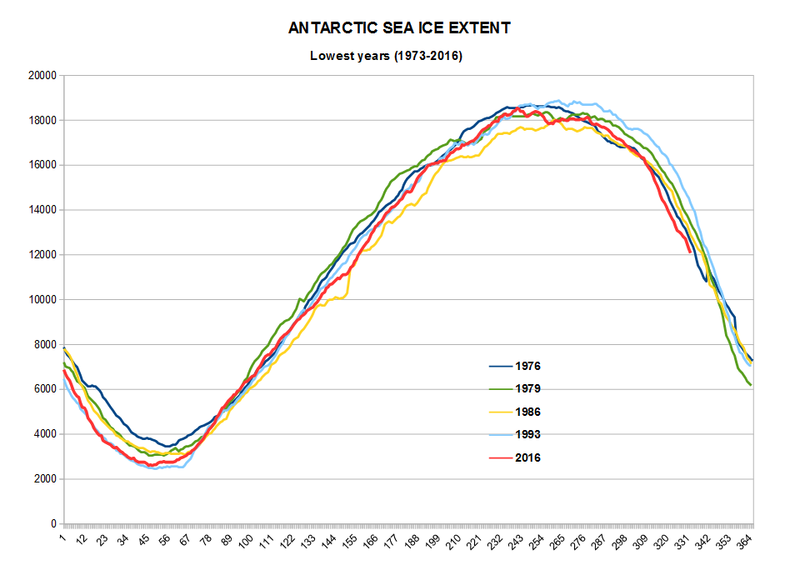 Seeing as we now appear to be seeing both the IPO flip and the last Nino's impacts clobbering Sea ice I have to wonder if we will see an uptick in major calves over the coming Austral summer? For Nov. 28th JAXA has posted 12,116,756 km2 for SIE around Antarctica. Edit: sorry, I didn't notice that Steven had already linked to this above. 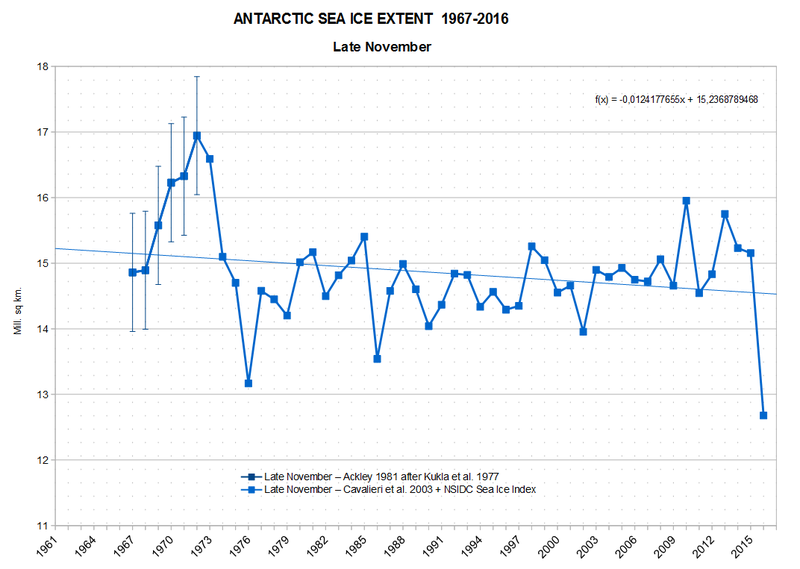 The current Antarctic sea ice extent is the lowest for late November from 1967 as well. There is a small downward trend from 1967 to 2016, although taking into account the larger error margins of the 67-72 numbers and the high interannual variability, maybe we should understand that the trend 1967-2016 is basically flat. Another big drop today according to NSIDC, -213K. By tomorrow we will most likely cross the mark of 12 Mn km2. December is the month with the biggest losses. A "normal" year, Antarctica sees a SIE drop of about 5Mn km2, or roughly -170K per day.